Wherever public libraries are working, possibility lives. The Public Library Association (PLA), a division of the American Library Association, is dedicated to supporting public libraries in measuring their performance with outcomes data. While many public libraries collect data about their programs and services, what is often lacking are the data to indicate the benefits libraries are providing their communities, such as programs serving childhood literacy, digital and technological training, and workforce development. Measuring outcomes means new ways for libraries to demonstrate their effectiveness beyond patron attendance and anecdotal success stories. Developed by library leaders, researchers, and data analysts, PLA’s Project Outcome is designed to give libraries simple tools and supportive resources to help turn better data into better libraries. Project Outcome is a FREE online toolkit designed to help public libraries understand and share the impact of essential library programs and services by providing simple surveys and an easy-to-use process for measuring and analyzing outcomes. Participating libraries are also provided with the resources and training support needed to apply their results and confidently advocate for their library's future. Project Outcome’s standardized surveys allow libraries to aggregate their outcome data and analyze trends by service topic, program type and over time. 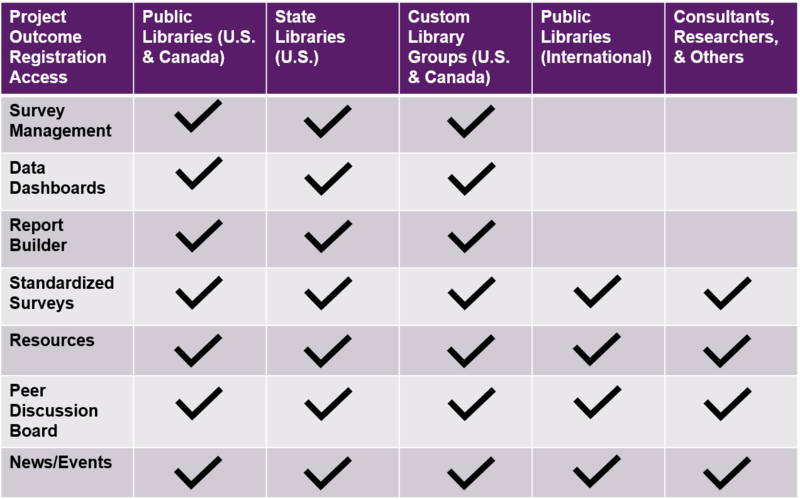 For the first time, libraries can see how the outcomes of their programs and services compare across their system, state and nationally. The Project Outcome surveys and toolkit are currently available to U.S. and Canadian public, regional and state libraries. Registrants that do not fall under these categories will still have access to all the outcome measurement resources. PLA is dedicated to helping libraries measure outcomes and hopes to expand its reach in the future. Instructions for registering as an international or other user can be found here: Creating a Project Outcome Account: International/Other (PDF). To start measuring the impact of your public library, register for Project Outcome for free today! View the Introduction to Project Outcome (Vimeo) and Creating a Project Outcome Account (Vimeo) videos to help get started. To see how far we've come, review our Annual Reports and Evaluations. Join the Project Outcome conversation on Facebook, Twitter @ProjectOutcome, and our Peer Discussion Board! If you are interested in hands-on training and are part of a large system, consortium, regional or state association, contact us to schedule a Project Outcome Regional Training (PDF). The Project Outcome toolkit provides libraries with FREE access to quick and simple patron surveys, an easy-to-use survey management tool to collect their outcomes, custom reports and interactive data dashboards for analyzing the data, and various resources to help move libraries from implementing surveys to taking action using the results. Libraries are encouraged to use their data to support and promote future action – from allocating resources more efficiently, to advocating new resources more effectively, to providing support for future library funding, branch activity reports, and strategic planning. For the first time, public libraries, whether they are new to outcome measurement or advanced in data collection, have free access to standardized outcome surveys and data analysis tools they can use to effect change within their communities and beyond. The Task Force has also developed the Outcome Measurement Guidelines, which are designed to help libraries conduct advanced methods of outcome measurement and demonstrate long-term, collaborative impact on the community. Anyone can register with Project Outcome to learn more about measuring outcomes and access the standardized surveys. The table below outlines the access different user types will have, indicated by a checkmark. Project Outcome is managed by the Public Library Association (PLA) and builds upon a 2013 initiative led by then-PLA president Carolyn Anthony (Former Director, Skokie Public Library), who established a Performance Measurement Task Force to develop standardized measures of effectiveness for library services and promote training and implementation tools for using the data collected. The Task Force is comprised of a diverse group of public and state library leaders, consultants, data researchers, and analysts. After collecting outcome data from 2013 PLDS survey responses and conducting pilot tests in 27 libraries in late 2014, the Task Force identified the seven essential library service areas for Project Outcome to assess that could be easily and directly linked to improving or changing a patron's knowledge, application, confidence, and awareness. The work of the Task Force caught the eye of the Bill & Melinda Gates Foundation. Their generous funding support has enabled PLA to accelerate and expand the reach of Project Outcome. PLA launched the Project Outcome Immediate Surveys and online toolkit on June 26, 2015 at the ALA Annual Conference in San Francisco. Upon release, the Task Force quickly started working on the next set of performance measures for libraries to capture community impact. Throughout 2015-2016, the Task Force developed and tested the Follow-Up Surveys that were released to the public on June 24, 2016 at the ALA Annual Conference in Orlando. The Health Survey topic was added in April 2019 in partnership with the National Network of Libraries of Medicine. The Association of College & Research Libraries (ACRL), a division of the American Library Association, is the higher education association for academic libraries and library workers. Representing more than 10,000 individuals and libraries, ACRL develops programs, products, and services to help those working in academic and research libraries learn, innovate, and lead within the academic community. Founded in 1940, ACRL is committed to advancing learning and transforming scholarship. Project Outcome for Academic Libraries is coming soon! The goal of the National Network of Libraries of Medicine (NNLM) is to advance the progress of medicine and improve public health by providing U.S. health professionals with equal access to biomedical information and improving individuals’ access to information to enable them to make informed decisions about their health. PLA is proud to have the support of NNLM and its Regional Medical Libraries to fund the Project Outcome health survey, which aims to capture the outcomes of public library health-related programs and services. PLA is able to expand the reach of the Performance Measurement Task Force's work with funding received from the Bill & Melinda Gates Foundation for the development and deployment of Project Outcome.